IMA is celebrating Onam which is a traditional harvest festival celebrated in the state of Kerala. Program will start at 10am with indoor games until 1pm followed by a GrandOnam lunch (19 items) and the stage show will start at 4pm to 9pm. We will have local artist performances and after dinner break we will be having rocking performance from Thiruvavaniravu team ( 6 celebrity artist from India). Ticket is the proof of purchase of the event and the holder of the ticket must be presented while on entry. No one will be permitted without the valued ticket under any circumstances. IMA Onam will be an Alcohol Free Event. Alcohol consumption is not permitted in and around the venue. Intoxicated Patrons will not be admitted to the Venue. Any Misconduct will be reported to the Police Present at the Venue. Illawarra Malayalee Association reserves the right to refuse admission in reasonable circumstances or to request the ticket holder to leave the Hall and take appropriate action to enforce this right. Parents are responsible to supervise their children at all times. 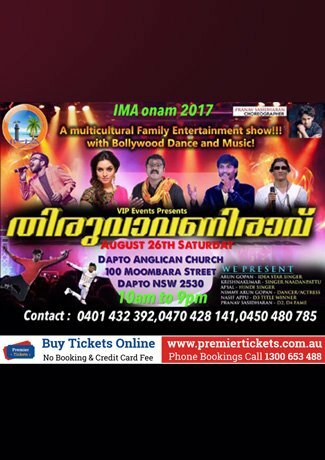 Illawarra Malayalee Association cannot be held responsible for the loss or damage to your personal property whilst at the venue. Your ticket can only be refunded in the event that the performance got cancelled. No One is allowed to enter the Performing Stage without the Consent of the Event Coordinators. Illawarra Malayalee Association reserves the right to refuse or revoke entry for any behavior or activity that is illegal, poses a safety risk or impacts upon other patrons’ ability to enjoy the event.